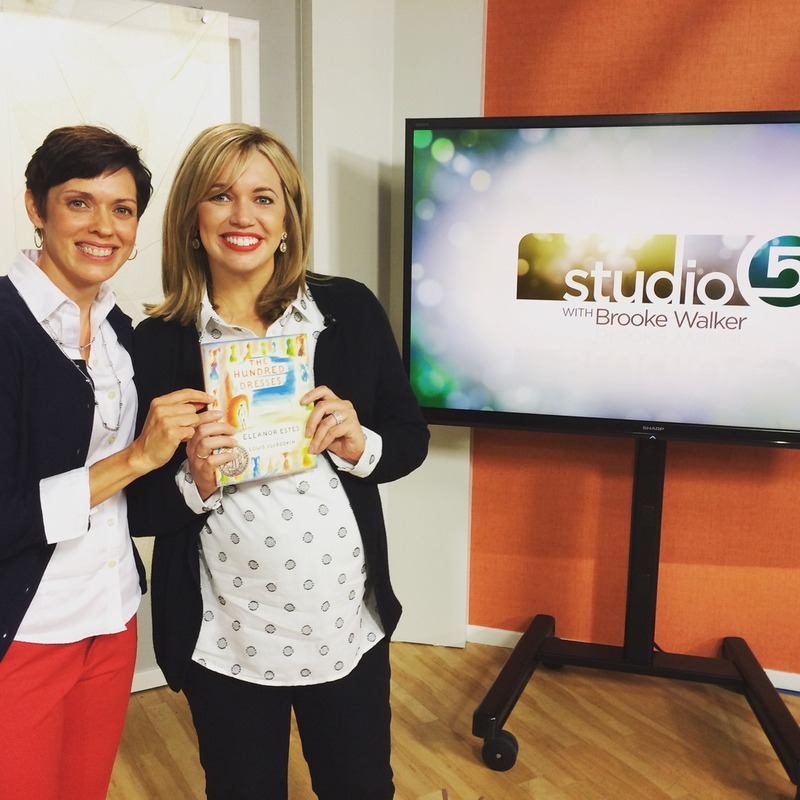 Last week I was asked to share with Brooke Walker (of Studio 5) 10 books families could read together over the summer. I didn’t have a whole lot of time to prepare, and it was no small feat whittling down the list to ten! But my sweet friend, Gaylyn (who knows the very best of children’s lit) helped, and together, we chose our favorites. Several classics with 1940-1960s publication dates. A few contemporary, and two new releases this year. Most are Newberry or National Book Award winners. You can watch the segment here. Don’t mind me. It was a flat hair day, my mouth felt like one big cotton ball, and I said “puddles and rizzles” instead of “puzzles and riddles,” but you know… rookie! Mind the books. It’s a great list. I’ve had some people ask me if I really do read to my older kids, and the answer is yes! I really do. In fact, I think it’s just as important to read to/with my older kids as to my younger ones, because my olders are finally at the age they can understand more complex concepts, ideas that can really change them and how they interact with the world. And, as I mentioned to Brooke, it gives me a chance to be close to them physically, sit next to them, snuggle with them on the couch, since that doesn’t happen as much as they get older. Reading aloud exposes children to new words, how to say them, what they mean, how to string them together. It offers them new perspectives, helps them see a certain time in history, a new culture, or a way of living they would never experience otherwise. It tells them you have time for them, that you care. And together you can share in something truly magical. I love this book because, who doesn’t have a child or know a child that learns differently? A child that feels like a fish being asked to climb a tree? Most school curriculums accommodate one kind of learner, and don’t know how to accommodate minds that are just as smart, but learn a different way. I recommend it for everyone – for kids who have worried about school, and also those who haven’t, so they can have compassion for those who do. KSL didn’t list the books on their website so I will do that here, with a few additional suggestions we are hoping to get to this summer. One other tip: I make reading the reward at night during the summer. If everyone can get in their pjs and tidy up their rooms, we’ll sit out on the lawn chairs, eat creamies, and I will read. Sometimes we read on a trampoline. Sometimes we rotate kids’ bedrooms so it’s a fun, new location every time. Also, all of these books (except maybe the 2015 releases) can be found on CD at your local library. Or on audible.com. If reading begins to feel laborious or you haven’t got the time, listen in the car on road trips, or just traveling around town! I’m trying to figure out how to embed a PDF so it is easier for readers to print the list below, but I haven’t gotten that far! For now, hopefully you can copy and paste the info below into a word doc and print from there. 1. The Hundred Dresses by Eleanor Estes (Newberry Honor book 1944). She also wrote The Moffats and Ginger Pye (which won a Newberry medal). Wanda wears the same faded blue dress to school every day, yet says she has one hundred beautiful dresses at home “all lined up.” Wanda is teased every day by a group of girls – who don’t believe her. One girl, Maggie, wonders if she can ever summon the courage to stand up for Wanda. When Wanda doesn’t come to school one day, they learn the truth about the hundred dresses. And about kindness and the golden rule. This might seem like a book for girls but its lesson of compassion and non-judgement is incredibly touching. A universal message that should be read by every school-age child. 3. The BFG by Roald Dahl (1982). Roald Dahl is a master storyteller. Other books by him: Matilda, James and the Giant Peach, Charlie and the Chocolate Factory. But the “Big Friendly Giant” is our favorite. The BFG is no ordinary bone-crunching giant. He doesn’t eat children like the other giants do. Which is lucky for Sophie, who spies him lumbering through her town one night. He takes Sophie home with her. When she realizes the other giants are “flush-bunking” off to England to “swollomp” a few little “chiddlers” she decides she has to stop them. And the BFG decides he’ll help her. It’s the play on language and words, like “frobscottle, whizpoppers, and redunculous,” that make this book so hilariously funny. Totally delightful to read out loud. Also excellent and by Kate DiCamillo is The Miraculous Journey of Edward Tulane (2006) about a china rabbit who belongs to and is adored by a girl named Abilene, but one day he is lost. 5. The Penderwicks by Jeanne Birdsall (National book award 2005). A summer tale of four sisters, two rabbits and a very interesting boy. The four Penderwick sisters spend summer in Maine on a beautiful estate known as Arundel. Their adventures, strong personalities, and family dynamics make all the Penderwick books absolutely charming. Birdsall’s books have an old-fashioned feel, affectionate humor, and we both adore and admire the sibling relationships. The Penderwicks is a series with the fifth and final book coming out this year. 6. A Wrinkle in Time by Madeleine L’Engle (Newberry Medal 1962). I love Madeleine L’Engle. She said, “If a book will be too difficult for grown-ups, you write it for the children.” And that is what she did with her series, A Wrinkle in Time, Wind at the Door, and Swiftly Tilting Planet… (Time Quintet: Five books in all). Meg Murry and her brother Charles Wallace are met at night by a disturbing visitor who knows about “the tesseract” or time travel, something their father was working on for the government when he disappeared. Meg and Charles Wallace travel through a wrinkle in time to try to save their father. This book, while disconcerting and scary at times, offers readers such a powerful message about love and truth. 7. Where the Mountain Meets the Moon by Grace Lin (Newberry Honor book 2009). This book is both written and illustrated by Grace Lin. My girls have loved it for its exposure to chinese story-telling and real chinese myths/folklore. Minli lives in the Valley of the Fruitless Mountain where she and her parents work hard in the fields for money and food. Her father tells her stories at night about the Old Man of the Moon, who knows the answers to everything. Minli sets out on a quest to find the Old Man of the moon because he will know how to bring good fortune to her family. Minli meets some magical friends along the way, including a dragon who cannot fly! 8. Escape from Mr. Lemoncello’s Library by Chris Grabenstein (2014). This book has been explained as a cross between Charlie and the Chocolate Factory and Night at the Museum. Kyle Keeley who loves all kinds of games is kind of the class clown. But when his hero, game maker Luigi Lemoncello, helps construct the town’s new library and has selected twelve kids (including Kyle) to play his first library game, Kyle gets serious. The game is a game of riddles, book, and clues. A game they have to win if they are going to get out of the library. Readers play along, deciphering puzzles and clues as they go. My kids loved this book. Grabenstein’s next book, The Island of Dr. Libris, was released in March 2015. 9. The War that Saved my Life by Kimberly Brubaker Bradley (2015). New this year. Historical fiction about a brother and sister who are London evacuees during World War II. Ada (10 yrs old) has never left her one-room apartment. Her mother is too humiliated by Ada’s clubfoot to let her outside. She keeps her locked up in side. But when Jamie (Ada’s younger brother) is shipped out of London to the countryside, Ada sneaks out to join him. Thus begins a new adventure for Ada and Jamie. And for Susan Smith, the woman forced to take the two kids in.This book has concepts appropriate for older children, I would say age 8 and older, including war, death, abandonment, and physical abuse. But I think it’s good for children to understand what life is like for many children in the world who struggle with these issues. The history is fascinating. And so is the story-line, about a girl at war inside herself for identity, self-worth, and family love. Inspiring on so many levels. 10. Fish in a Tree by Lynda Mullaly Hunt (2015). Also new this year. This exceptional book is about a girl named Ally who is very bright, a whiz at math in her head, but has dyslexia. Ally has cleverly slid through school pretending that she knows how to read and write when really, she has never been able to learn. In sixth grade, things change. Her teacher, Mr. Daniels, catches on and offers to help Ally. This book should be read by every child who has ever worried about school. And by children without learning differences, so they can better understand that all children learn differently. Main take-away: “Not all great minds, think alike.” This book will tug at your heart. Similar to Wonder by RJ Palacio, in setting and context, but different in that Ally looks just like everyone else on the outside, while inside, her brain and mind see things very differently. Fish in a Tree will teach you about dyslexia, and how many smart kids are misunderstood; they simply learn differently. The Chronicles of Narnia by CS Lewis. Most people think the books begin with The Lion, Witch and the Wardrobe. But they actually begin with Lewis’ book, The Magician’s Nephew. We thought it would be fun to try and get through all seven books. Sarah, Plain and Tall By Patricia MacLachlan. And everything else by MacLachlan. Gifted writer who has crafted some very tender stories. Miracles on Maple Hill by Virginia Sorensen. Also historical fiction, set in post WWII. And we LOVE this book of original poetry by Jack Prelutsky: The New Kid on the Block. So funny! Thanks Cath, I always love having your recommendations, looking forward to starting a few this summer. Holy cow, Cath! You were awesome – so composed and well-spoken. Some fun ideas for the summer. Ahhhh!!! So awesome!!! Have we shared this on Power of Moms yet? I knew they asked you, but I never heard anything else until I saw it today on your blog. SO wonderful!! Cath, we can put the PDF up on Power of Moms, if you'd like. I can just add it as a media file. And we definitely need to put this in the newsletter. You are amazing!!!!! Your lists are always a gift to me. Thank you!!! I'm a recent new reader, but glad to have found you. I appreciate you posting your book lists, and sharing your writing and thoughts. There is strength that comes as others share their challenges, joys, and lives, especially as they mother. Thank you!